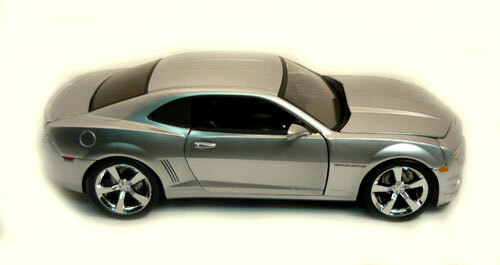 This 2010 Chevrolet Camaro SS 1:24th Scale is by Jada and of the Bigtime Kustoms Collection Series. The hood opens to reveal and beautifully detailed black and silver stock engine. The doors open to a black interior with detailed dash and chrome shifter and peddles. This model it free wheeling, the trunk opens and has chrome wheels and black wall tires.